The chimaera is one of the ocean’s most bizarre and intriguing creatures. These ‘living fossils’ are closely related to rays and sharks, but scientists believe that they branched off from their cousins between 300 and 400 million years ago. Since then, they have evolved in isolation. Chimaeras’ bodies are composed entirely of cartilage, like other elasmobranchs (cartilaginous fish). Another shared feature is a pattern of minute facial pores that allows these creatures to detect their prey even in pitch black waters. The pores are called Ampullae of Lorenzini. They are filled with a gel-like substance that acts as an electrical conduit. This enables them to pick up on the impulses emanating from the small fish and octopuses they feed on. In some chimaeras, theses sensory organs occur in the form of two parallel rows of minute openings on the forehead. In others, these sensory organs have developed into elongated noses that act as marine metal detectors on the ocean floor, rooting up their prey via electrical signals. Chimaeras typically inhabit the darkest depths of the ocean – far beneath the reach of your average scuba diver. They live as far as 4500m under the surface of the sea and rarely occur above 200m. This remote habitat means human eyes rarely see them firsthand. As a result, they are among the most enigmatic of all fish species. Biologists have dubbed them ‘Ghost Sharks’ due to this mysterious and elusive nature. Scientists believed that these ‘ghosts of the deep’ were extinct in the Northern hemisphere until 2009. Then a team of geologists discovered them during deep sea surveys of the coasts of southern and central California and Hawaii. 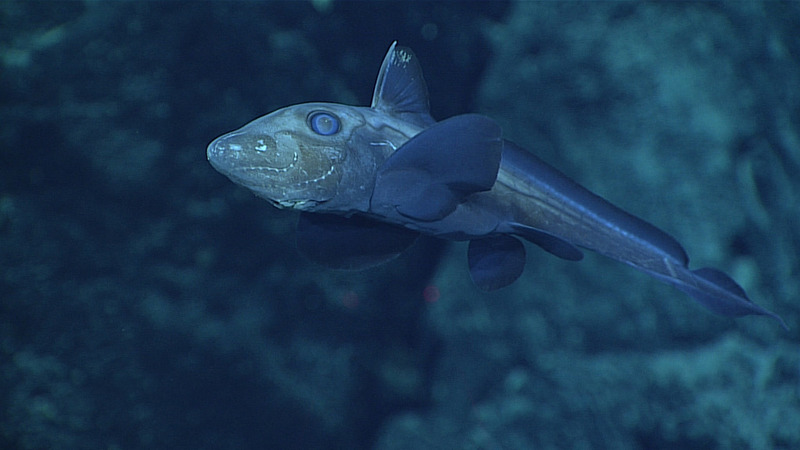 Their Remotely Operated Vehicle (ROV) kept on bringing up images of a particular species – the Pointy Nosed Blue Chimaera. It had never been witnessed in these waters before. Chimaeras are elasmobranchs (cartilaginous fish) like sharks and rays, but they have evolved in isolation for millions of years. For many years, researchers believed that chimaeras occured exclusively in the Southern Hemisphere. However, in 2009 researchers discovered them living in the deep seas off the coasts of Hawaii and California. There are around 40 chimaera species. These enigmatic deep-sea fish have large, pronounced heads which taper to a slim, smooth body and rat-like tail. They have wing-like pectoral fins. They tend to swim much slower than their cousins in loftier oceans, using their ‘wings’ to propel themselves. These elasmobranchs typically live in much deeper waters (between 200m and 2500m down) and look entirely different to their relatives. Chimaeras have various nicknames. 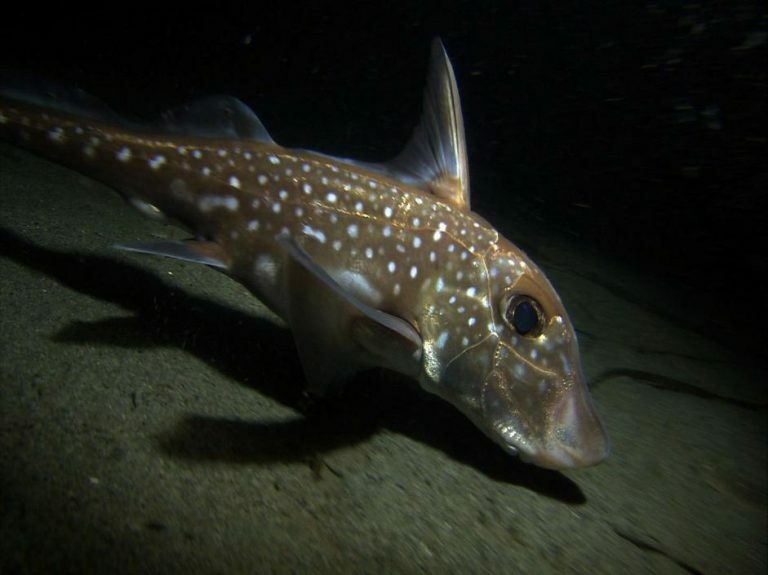 People refer to them as ghost sharks or ‘spookfish’ due to their mysterious and elusive nature and ‘ratfish’ because of their long, thin tails. Some call them rabbitfish or water bunnies due to their large, round eyes, plate-like teeth (used for grinding up prey) and wide nostrils. Many chimaeras have venomous spines located at the base of their anterior fin. Females lay eggs sheathed in leathery cases.